Fox is announcing summer premiere dates for new series Love Connection, Beat Shazam, The F Word with Gordon Ramsay and Superhuman, as well as the returns of MasterChef, American Grit and So You Think You Can Dance. This summer, Thursdays are all about match-making and music, with the debuts of Love Connection and Beat Shazam on May 25. All-new unscripted series Love Connection kicks off the night at 8:00PM ET/PT on Fox hosted by Emmy Award winner Andy Cohen (Watch What Happens Live With Andy Cohen) and executive-produced by Mike Fleiss (The Bachelor). New interactive game show Beat Shazam, hosted by Grammy-, Golden Globe- and Academy Award-winning actor and musician Jamie Foxx (Ray, Django Unchained) debuts at 9:00PM ET/PT, executive-produced by Mark Burnett (Survivor, The Voice). On Wednesday, May 31, new LIVE series The F Word with Gordon Ramsay debuts, following the Season Eight premiere of MasterChef at 8:00 PM ET/PT. Based on his hit U.K. series, each distinctive and fast-paced hour will combine good food and great cooking with Ramsay's passion, energy and humor into a one-of-a-kind LIVE series. On Sunday, June 11 at 9:00 PM ET/PT, WWE® Superstar John Cena® brings 17 new competitors – all who either have lost their grit or never had it – to sunny Hampton Island, GA in American Grit. Hosted by Cat Deeley and featuring the return of Mary Murphy as judge, alongside Nigel Lythgoe, So You Think You Can Dance enters its 14th season on Monday, June 12 at 8:00PM ET/PT. Following So You Think You Can Dance, get ready to have your mind blown when Superhuman premieres at 9:00PM ET/PT Hosted by actor Kal Penn, and featuring panelists Mike Tyson, Christina Milian and Dr. Rahul Jandial, this jaw-dropping series of one-hour episodes tests the abilities of ordinary people to use their extraordinary skills to win a $50,000 grand prize. Additionally, the 2017 Miss USA® competition is set to air live on Sunday, May 14 from 7:00-10:00 PM ET live/PT tape-delayed). The not-to-be-missed three-hour special programming event will conclude with Miss USA 2016 Deshauna Barber crowning her successor. Additional finale dates, summer premiere dates and schedule information to be announced. The ad men of the Motor City keep their creativity flowing as Comedy Central has renewed Detroiters for a second season. Executive produced, created and written by Sam Richardson, Tim Robinson, Joe Kelly and Zach Kanin and executive produced by Lorne Michaels, Jason Sudeikis, and Broadway Video's Andrew Singer, the second season will launch next year. The series, currently in its first season airing Tuesdays at 10:30 p.m. ET/PT, stars real life best friends Sam Richardson, from Detroit, and Tim Robinson, from Metro Detroit, as small-time ad men in the Motor City. Whatever they do, they do it together. And no matter what happens, Sam and Tim's love for each other and their city never wavers. Jason Sudeikis appears in a narrative arc as a successful Chrysler brand executive whom Richardson and Robinson relentlessly pursue in an effort to land their first big-time client. Season one guest stars include Obba Babatunde, Michael Che, Comedian CP, Steve Higgins, Richard Karn, Rick Mahorn, Keegan-Michael Key, Kevin Nash, Wendy Raquel Robinson, Cecily Strong, Trick Trick, George Wallace and Malcolm-Jamal Warner. Monika Zielinska and Rachel Olson are the Executives in Charge of Production for Comedy Central. 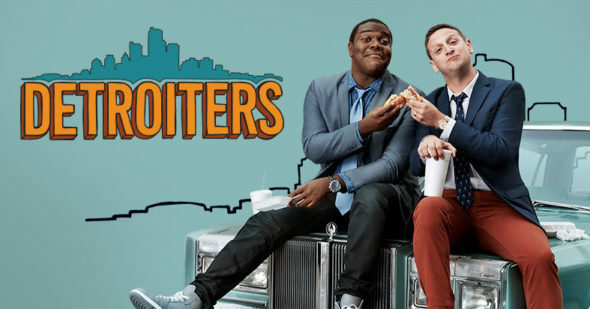 Season one episodes of Detroiters are available via cc.com on the day each new episode premieres to fans who authenticate via their cable or satellite provider, as well as via the Comedy Central App. In addition, they are available the day after air on iTunes, Amazon Video, VUDU, Microsoft Movies & TV, Verizon Multi-Screen, Google Play, Frontier Communications, and Sony Interactive Entertainment.